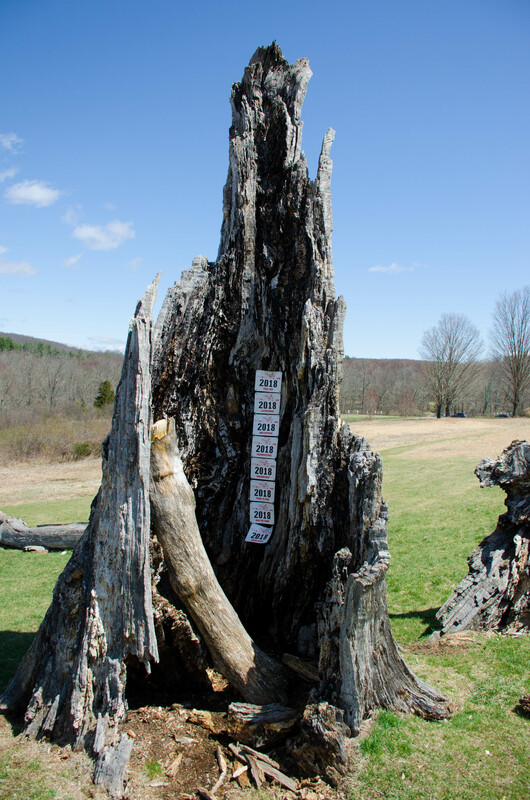 We wrapped up the 2018 Trail Mix Series with the Raven Rocks Run at Ward Pound Ridge Reservation on Sunday, November 11, 2018. 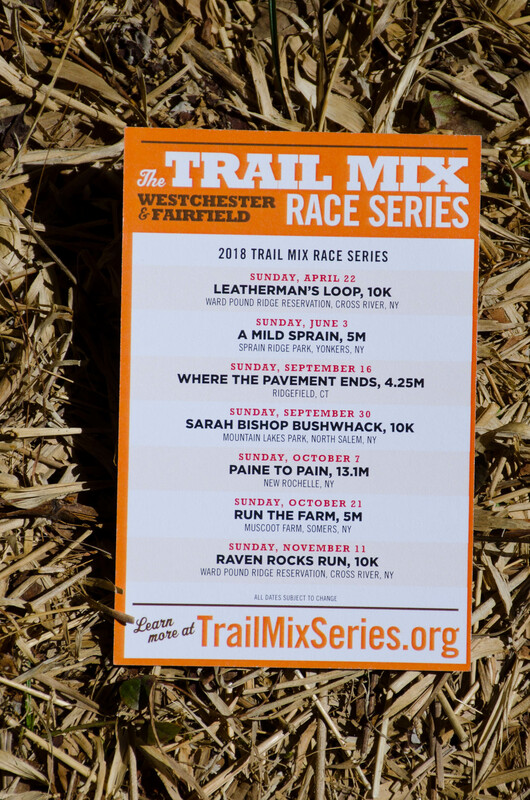 Note – ALL runners who completed the 2018 Trail Mix Series by running at least four of the seven races in the series are eligible for automatic selection in the Leatherman’s Loop Lottery as long as they enter the Loop Lottery in January 2019. In 2018 there are 82 runners who qualify for the automatic selection in 2019. See links to Men’s and Women’s standings links above for listing of all runners eligible. Lindsey Felling in the final mile of the 2018 Run the Farm. Lindsey Felling won the Women’s Trail Mix Series for 2018. Lindsey won her last two races to take over the lead. Congratulations Lindsey! Louise Mullan finished a very close second overall — just 0.21 points behind Lindsey — and first in the F30 category. Kelsey Crawford finished third overall and won the FJr category. Emily Bocklet took fourth overall. Britt Benn was fifth overall. Deborah Young took the F40 category and sixth overall. Kathy Lynch won the F50 category. Michele Stefanov won the F60 category for the second year in a row. Cathy Nottage was the only woman to run in all seven Trail Mix Series races this year — well done Cathy! Alexsei Chernov in the home stretch of the 2018 Sarah Bishop Bushwhack. Aleksei Chernov won the 2018 Men’s Trail Mix Series. Aleksei won one of the four races in the series he ran in and came in very strong in the other three races. Congratulations Aleksei! Matt Bedoukian came in second overall and won the M30 category. Jacob Benesch ran in all seven Trail Mix Series races and came in a very close third just 0.02 points behind Matt. Guy Benn was 4th overall and first in the M40 age group. Bill Bradsell took fifth overall and the M50 category for the fourth year in a row. John Walsh took the M60 category. Rob Fryer won the M70 category for the second year in a row. Christopher Demuth III won the M13 & under category and was the youngest finisher (10 years old) of the Trail Mix Series for te second year in a row. Nice job Christopher! Charlie Vaccaro continued his unbroken Trail Mix streak, running in all twenty-seven Trail Mix races since the series began in 2014. Eric Foxhall has participated in 22 of the 27 Trail Mix races to date. Jacob Benesch ran in all seven Trail Mix 2018 races as did eight other men including Gabriel Brecher, Paul Woolley, David Vogel, John Goodrow, Christopher Demuth III, Chris Demuth Jr, Christopher Dean, and Charles Vaccaro. Cathy Nottage was the only woman to run all seven in the 2018 series. 82 Runners – 60 men and 22 women – finished the 2018 Trail Mix Series. 2,712 different runners (969 women and 1,743 men) competed in at least one race in the 2018 Trail Mix Series. Congratulations everyone on a series well run – and enjoy that well earned automatic selection in the Loop Lottery as you enter it in January 2019! Below is the Complete List of Runners who completed the 2018 Trail Mix Series. These runners are eligible for automatic selection in the Leatherman’s Loop 2019 Lottery — if they enter the Lottery! There are 29 women who are currently eligible for scoring in the Trail Mix Series. Lindsey Felling has taken over the series lead with Louise Mullan just 0.04 points behind Lindsey in second place. Kelsey Crawford fell to third overall after Run The Farm, down by less than 1 point. Emily Bocklet is not far behind Kelsey in fourth overall. Katie Hulme is in fifth overall and is the first in the Juniors category. Of the top 5, Kelsey and Katie both have completed four races which is enough to be officially scored. This tight race makes for some interesting scenarios: Each of the top 3 female runners has a chance to take it all at Raven Rocks by finishing above the other two. Kelsey can win the series by finishing higher than Lindsey and Louise. Lindsey can guarantee an overall win by beating Kelsey and Louise. And Louise can take it all with a win over Lindsey and Kelsey. It will be exciting to see who takes the prize! Kelsey has a chance to come back and win the series with an overall win at Raven Rocks and get the first ever perfect score. 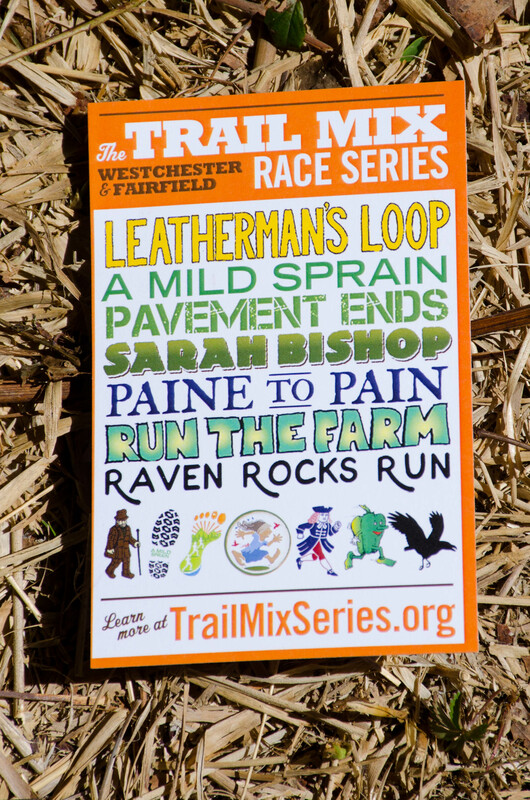 We only count the top 4 trail mix race finishes — and she will have five if she wins Raven Rocks enabling her to drop her lowest point score. Deborah Young is leading in the F40 category with four races completed of the six run so far in the series. Kathy Lynch leads in the F50 category with four races completed. Michelle Stefanov leads in the F60 category. Of special note — Cathy Nottage is the only woman to run all SIX of the Trail Mix Series races in 2018. Congratulations Cathy! There are 77 men who are currently eligible for scoring in the Trail Mix Series.. Alexei Chernov has taken over the lead in the men’s Trail Mix Series. Matt Bedoukian is trailing by just under a point in second place. Jacob Benesch is third – and Jacob has run in all six of the 2018 Trail Mix Series races to date. Guy Benn and Bill Bradsell have five and four races under their belts, respectively. Bill has won the M50 category each of the last two years and is trailed by Randolph2 and Paul Limmiatis. Guy is eading the M40 category, trailed by Mikhail Yeremeev, Edmund Dee, and Tom Curley. Christopher DeMuth III is leading the 13 & under division with Zachary Bertin on his heels. Of special note — Christopher Dean, John Goodrow, Jacob Benesch, Paul Limmiatis, Gabriel Brecher, Charles Vaccaro, Paul Woolley, Christopher Demuth III, and Chris Demuth Jr have all run every Trail Mix Series race to date (six total) in 2018. There are two more races in the series — that means if you have run in at least two races in the series to date you can still finish the 2018 series! Of course you don’t need to run in the series to race in these trail races. The final race in the series is the Raven Rocks Run on Sunday, November 11 at 9am. Hope to see you there! PS: Let us know of any scoring mistakes or omissions and we will fix them ASAP! There are 63 women who are currently eligible for scoring in the Trail Mix Series. Kelsey Crawford maintains her commanding lead with a perfect score so far. Kelsey has won every Trail Mix race she has entered in 2018. The women’s age category races are very tight with Lindsey Felling and Louise Mullan within 0.2 points in the F30 age category. Emily Bocklet is not far behind, and Emily has completed three races and needs just one more to qualify for final scoring. Lindsey and Louise each have two races in the series under their belts. Katie Hulme has a comfortable lead over her nearest competition in the Juniors category. Katie needs just one more race to complete the series. Deborah Young is leading in the F40 category with three races in the books. Jourdan Pignatelli leads in the F20 category with two races to date. Kathy Jackson leads in the F50 category with two races completed. Of special note — Cathy Nottage is the only woman to run all five of the Trail Mix Series races in 2018. There are 142 men who are currently eligible for scoring in the Trail Mix Series.. Michael Oliva and Luis Francisco had two strong finishes early in the series but have not appeared in a fall Trail Mix race to date. Alexei Chernov did not race the two spring Trail Mix races and his only two appearances were in fall races. Even though they did not line up head to head, Michael and Alexei are separated by a mere 0.02 points in the standings. Luis is just 0.1 point behind. They will all need to complete the final two races in the series to qualify for scoring. Justin Lubeley is very close as well, with strong finishes in the Loop and P2P. Matt Bedoukian is currently in 6th overall. Jacob Benesch is next up – and Jacob has run in all five of the 2018 Trail Mix Series races to date. Bill Bradsell and Guy Benn have three and four races under their belts, respectively. Bill has won the M50 category each of the last two years and is on track to repeat. Shane Waring is leading the 13 & under division with Jackson Bieber, Christopher DeMuth, and Zachary Bertin on his heels. Of special note — Christopher Dean, John Goodrow, Jacob Benesch, Paul Limmiatis, Gabriel Brecher, Charles Vaccaro, Paul Woolley, Christopher Demuth III, Chris Demuth Jr, and Scott Sutton have all run every Trail Mix Series race to date in 2018. The second race of the 2018 Trail Mix Trail Series is set to go on June 3rd at 9:45am sharp. A Mild Sprain is held at Sprain Ridge Park in Yonkers, NY. This year marks the 7th year of the race. Race directors David Vogel and Brant Brooks are gearing up for a big crowd and great fundraising for JDRF. They hope to surpass last year’s record fundraising. Sign up and come to Sprain Ridge Park and Run! We’re looking forward to seeing you there! The third race in the series is called “Where The Pavement Ends” and will be held in the Fall, September 16, 2018, at Lake Windwing in Ridgefield CT. More information and registration for that race can be found on their website. 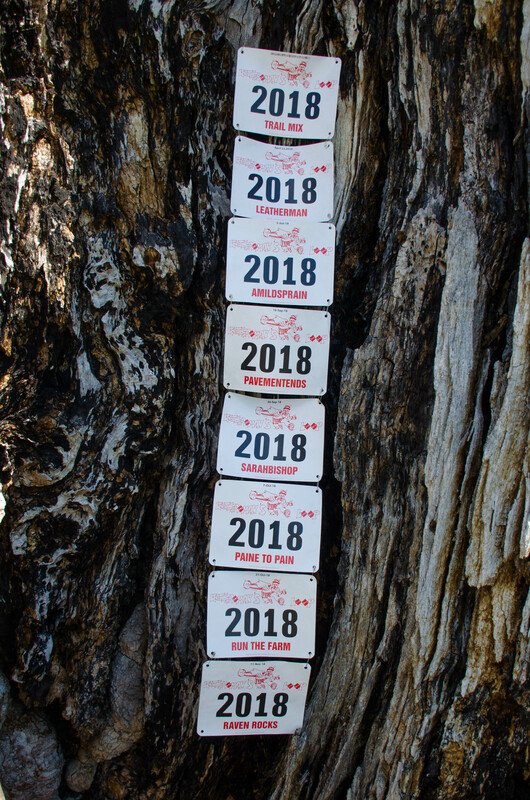 Nearly every runner who completed the 2017 Trail Mix Series was registered for the 2018 Leatherman’s Loop this past weekend! Congratulations on finishing for 2017 and starting the 2018 series off with a great and memorable run! Click here for information about the 2018 series and registration for the individual races.